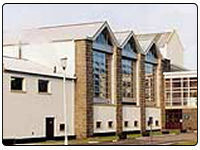 Aultmore Scotch Whisky Distillery was built in 1896 by Alexander Edward of Forres and produces Aultmore 12 Years Old, but also produces a few independent bottles. The distillery is situated a few miles away from Keith on the eastern side of the Speyside region in Scotland. In 1971 the distillery was rebuilt from nearly scratch and another pair of stills was added to the original pair. Looking at what the distillery is like today compared before the rebuild in 1971 there is nothing left of the old distillery and in a way a bit of history has also vanished. The distillery contact details are Aultmore Distillery, Keith, Banffshire, AB55 3QY with the telephone number for any enquiries +44 (0)1542 882762. You can find out more regading this distillery by visiting the Gordon and Mcphil website at www.gordonandmacphail.com where they have a page of interesting fact relating to this distillery and all the trouble the distillery went through in the early 20th century. You can see the Aultmore Single Malt Whisky Range on this website.